I read a book review in Science News, Games Primates Play, and just had to share it through a post here. I don’t know if the link works so I’ll just paste the whole review below first. Even decked out in cultural finery, people make monkeys of themselves. Maestripieri, a veteran monkey investigator, builds a fascinating and occasionally disturbing case for fundamental similarities in the social shenanigans of people, apes and monkeys due to a shared evolutionary heritage. Maestripieri spies unspoken primate customs lurking in mundane human encounters. In a crowded elevator, people instinctively stand still and avoid eye contact, keeping their distance when only two remain. An ingrained need to defuse potential aggression when confined with strangers drives this behavior, Maestripieri argues. He has observed similar behavior in pairs of female macaques put in a small cage. To break the ice, the monkeys bare their teeth to signal fear and friendliness before grooming each other. It’s a short jump, he says, from caged macaques to two people in a high-rise elevator chatting nervously about the chance of rain. Maestripieri also describes the evolutionarily deep appeal of nepotism. In female-run macaque societies, big shots’ daughters are guaranteed privileged lives while daughters of bottom-feeders eke out a miserable existence. Maestripieri relates this behavior to his own run-ins with kin favoritism in Italy’s military and universities. Both people and macaques often hurt competitors if they can get away with it, Maestripieri says, but play nice in public. So it goes among scientists: Senior researchers attack rivals and young challengers in anonymous peer reviews. This would improve instantly with open review, he predicts. 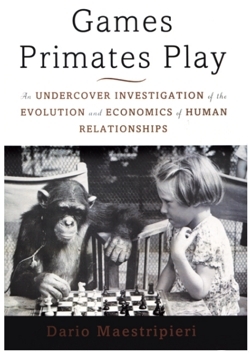 Other research described in the book finds commonalities in primate cooperation and friendship, as well as in power plays, playing favorites and other dark social arts. In the end, Maestripieri’s theme is hard to deny: Monkey business is everyone’s business. Thanks to advances in science and technology, we are finally beginning to make real progress towards knowing and understanding ourselves as we are. In other words, we are beginning to see ourselves as animals first and foremost rather than the species-centric ideals with which we have always maintained our illusion of self (ego). (1) What does ‘now’ mean, anyway? I see ‘now’ as lying in the eye of the beholder. Normally, we judge time from the perspective of a human lifetime. More to the point, our sense of time connects directly, albeit subtly, to desire. Buddha in his second truth said, “… The surrounding world affects sensation and begets a craving thirst that clamors for immediate satisfaction. The illusion of self originates and manifests itself in a cleaving to things.” ‘Cleaving’ to our ideal species-centric views and ‘clamoring for immediate satisfaction’ makes it hard to reach impartiality, but science will win out in the end I imagine. Hold the ancient way in order to manage today. This is called the way’s discipline. Note, “disciple”, the root of discipline, can help broaden understanding.